American composer, multi-instrumentalist and singer, Gingger Shankar is best known for scoring the background in the Oscar nominated film ‘The Passion of the Christ’. 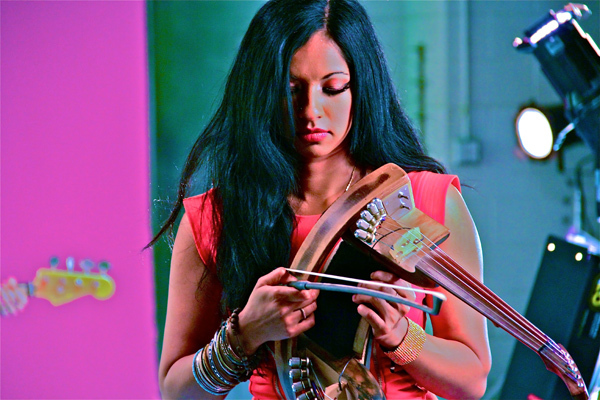 Shankar, who is the eldest daughter of violinist Dr L Subramaniam, has been part of a number of prolific projects including performing alongside several big names like Steve Vai and Smashing Pumpkins, and scoring music for films like ‘Circumstance’ and ‘Monsoon Shootout’. Her mother, Viji Subramaniam, was a classical singer, as was her grandmother Lakshmi Shankar, who was sister-in-law to noted sitarist- Ravi Shankar. Apart from being renowned for her family background, she is the only woman in the world who can play the double violin. In an interview with Radioandmusic.com’s Dhairya Ingle, Shankar talks about her upcoming album, her interest in double violin and more. Tell us about your childhood and the musical influence that your family has had on you? My mother is probably the biggest influence in my life, both personally and musically. She would play me everything from MS Subbulakshmi to the Beatles. I learned the violin from my grandmother, singing from my mother and grandmother. My mother, was an incredible singer, also took me to western opera, violin, and piano classes. My father exposed me to so many incredible musicians and composers- Heifetz, Beethoven, Mozart and many more. I remember meeting MS Subbulakshmi, Yehudi Menuhin, Stéphane Grappelli, VG Jog and so many other incredible artistes as a child. Now I understand what blessings I had! I am definitely inspired by all the musicians in my family as well. As I went into my teens, music became my life/career. I do not think I ever made a choice. It was very natural and something I always wanted to do. I love it and cannot imagine doing anything else. You are currently working on an album- ‘Nari’. Tell us about it. The idea came to me after my grandmother passed away early last year. I wanted her and my mother's story to be told. It is such an important one for music, as well as for me, wanting to tell the story of two people who greatly influenced my life. The album has 13 tracks and is currently in post production, so it will be released soon. How did you get interested in playing a double violin? It is an instrument that covers the entire orchestral range- violin, viola, bass and cello. There are only two in the world and I love the sound of it. It provides a tone and sound unlike any other instrument. Whether I am performing live or doing soundtracks, it gives me such a wide range of sounds to work with. The challenge is that so many people have never heard of it, but that is slowly changing. As a film composer, what is your goal for a film score? What impact do you want the film’s music to have on its audience? Firstly, it has to be understood well by me so that I can deliver. My goal is to give my best, understand the content that is required and then to deliver. As far as the audience is concerned, I feel my music should enhance every scene and create an impact. Have you been approached by Bollywood to compose music for films? Yes! I have been and have also worked on a few projects like ‘Monsoon Shootout’, featuring Nawazuddin Siddiqui, which is yet to release. I also composed for ‘Katiyabaaz’. You have also set up a company called Little Girl and the Robot, tell us more about it. Little Girl and the Robot is my music production company that does music and sound design for commercials and videos. We have had the opportunity to work with the UN, the Veteran’s Administration, People’s Television, Breakthrough and other great organisations. The idea of the name came from the hybrid of music (little girl) and sound design (the robot). Which Indian singers would you like to collaborate with? I would love to work with AR Rahman, Lata Mangeshkar, Alka Yagnik and Sonu Nigam, to name a few. What do you do when not recording or not in the studio? I do not get a lot of time free from music, but when I am not working, I make it a point to spend time with my friends and family. Meghdeep Bose is one name, who has been doing rounds in the Bollywood circle for his quintessential music production as well as arrangement since he came into the picture with the Bollywood film, Hero. We may be born in their era or not, but we do look up to them for their art. Their movies are classic but seldom do we get to know about their lives behind the camera. We are talking about the yesteryear actors, who ruled the box-office during their good days. MUMBAI: British singer Tripet Garielle is known for her soulful voice. But, after being criticized for her accent, she took it as a challenge and practiced singing in Hindi by rehearsing Lata Mangeshkar’s songs for about 10 years. Candice Redding is one of the top DJs in the world.